Sows must live in a space barely larger than their bodies. The stall limits their movement to a couple of steps forward or back. Sows are selectively bred to produce ever larger litters and as a result, many sows no longer fit this tiny space (2′ x 7′). More than 1.1 million sows are kept in Canada, with about 318,000 in Manitoba, 341,900 in Ontario and 319,000 in Quebec. 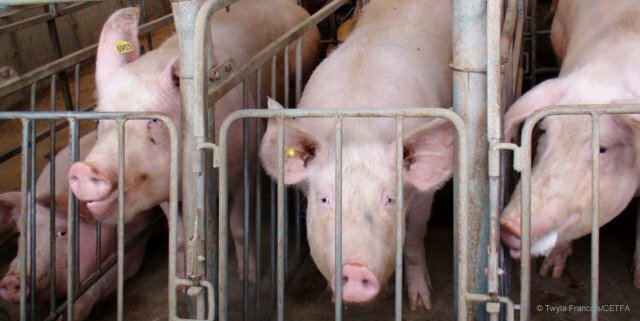 The vast majority are intensively confined in sow stalls. For more information, read CETFA’s scientific advisor Op Eds Canadian Pig Industry: The Need for Change and Codes of practice fail to protect Canada’s animals from abuse and suffering. 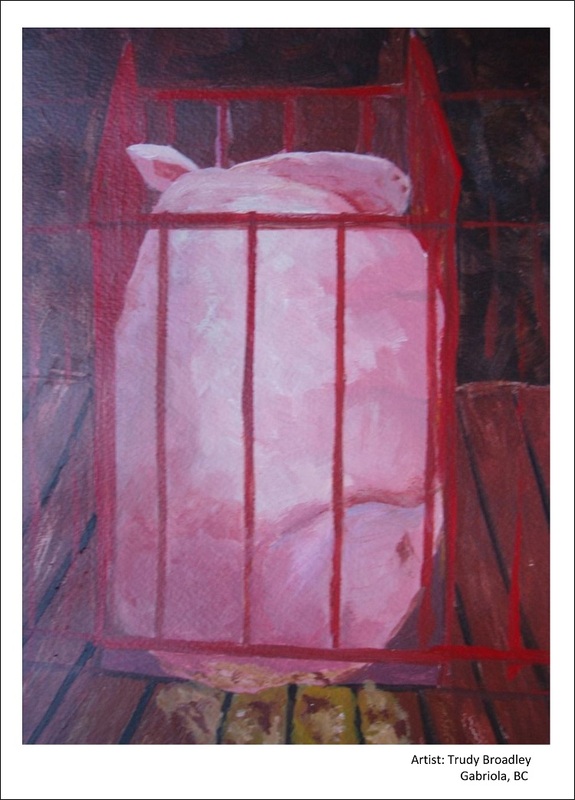 CETFA has extensively documented the conditions of sows in gestation crates in Canada. See for example The impact of sow stalls on sows’ health and welfare, Sow stalls: a mother’s worst nightmare, and The secret lives of sows. CETFA has also held meetings with – and/or given presentations to – government and industry representatives, co-created a TV add using CETFA’s footage that was played for months on CBC and CTV, c0-created a website dedicated to sow stalls, participated in a campaign asking Tim Hortons to only offer pork products that do not come from gestation-crated sows, organized letter writing campaigns, contacted the media and did many interviews, co-created several petitions and gathered signatures, held information tables and given presentations to classes. CETFA continues to work towards the end of the use of sow stalls/gestation crates in Canada. Sows in gestation crates on a Canadian factory farm. Photo credit: CETFA. 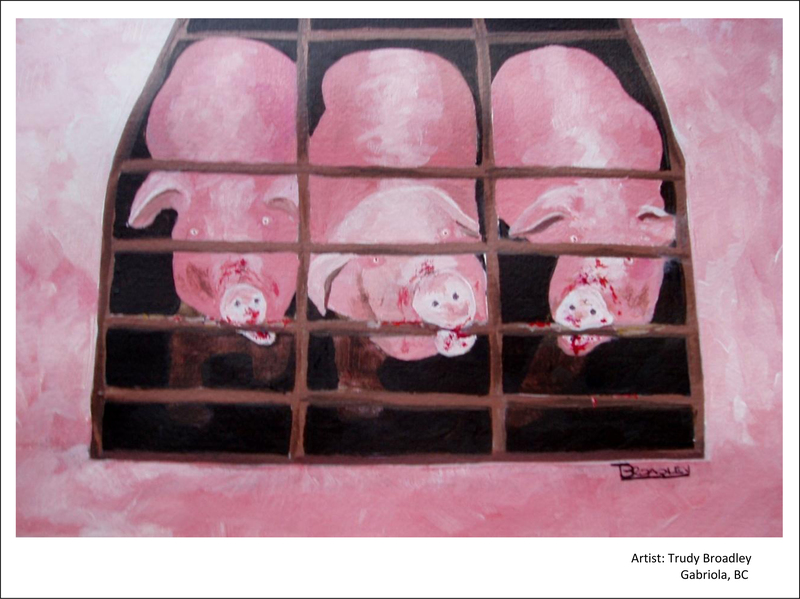 Painting made by BC artist Trudy Broadley for CETFA’s sow stalls campaign.